There are many techniques and methods that may be used to gather back and focus the mind. I will describe only a few. None of them are better or worse than the other as they all share the same purpose, which is to gather back and focus the mind and attention. The eyes regard the nose. You bring your eyes to a focus but it’s going off a forty-five degree angle. The nose regards the mouth so you can feel the direction of your intention and attention going inward. That being the case, the thinking mind, the conscious mind, what’s called the sixth consciousness will then begin to babble, chatter and go crazy because it’s so used to running out all over the place that when you ask it to come down, drop down into the well and be quiet, it says, “What? No way! This is really boring.” It rebels. This is what’s called the “monkey mind” and it quickly wants to climb back up and shoot out your eyes. Your eyes will want to start darting and you close that door. The eye door closes when you bring your eyes to the forty-five degree angle and can’t focus on anything. The “monkey mind” will then want to go out the ears. You’ll bring your attention back to your ears and your nose will start to want smelling and taste… That door closes with the tongue curled on the roof of the mouth. You’re not chewing or eating anything, sucking on candy, or anything, hopefully, while you’re meditating. Then, it will want to go out through body activity and get busy. But you’re sitting in this posture and so you’ve gathered back in the six sense organs. Normally the mind just runs out and that just leaves the inner consciousnesses: the sixth, seventh and eighth consciousness as its only playground left. That’s where it really kicks into high gear. “Ok, you’re going to deny me things with my eyes, ears, nose, tongue, and body, then I’m going to go to the video store within and I’m going to start channel surfing on the consciousness.” That’s what it does. You’re trying to sit here in quiet meditation and your mind is running to yesterday, to tomorrow, kind of playing around with the here and now; what was the band playing, blah, blah, blah. Just running all over. It starts having memories and reflections, thoughts, and fantasies. What else goes on in your mind? What do you think is going on in other people’s minds as they’re sitting here during this forty-five minute quietude? Volunteer: Plans, shopping lists, things I wish I could have done. Regrets. The opposite would be things I wish I hadn’t done, worries. Ten worries lead to ten thousand. They just multiply. Fears, conversations you’ve had or conversations past, present and future. Conversation you hope to have or hope to avoid and then present conversations which are sort of just muddling around. Parents, lovers, friends, family, enemies; all of those will start to come up at this point. As you get those things quieter and quieter, you will go deeper into the recesses: What you did before you got married, what you did as a graduate, what you did as an undergraduate, what you did in elementary school, secondary, middle school. Middle school is a really fertile ground. You can call up all kinds of things. What you did in kindergarten. What you did in the earliest stages of your memory. When you get really focused and you really try to quiet the mind, it will squeeze into what you almost think of as pre-cognitive memories. Memories you didn’t think were possible to draw out. Some people can go back into the womb. The Buddha in this stage of meditation went into the womb and into his previous life and then even into previous lives. The faculty of the mind to know this kind of stuff is there. It’ s innate. Part of the process of meditation is just letting that process take itself through. Do not attach to any of these things as they come up, don’t fish for them and don’t seek them. Just watch them as they rise and fall, rise and fall, rise and fall. A lot of patience is required here. At times, incredibly blissful experiences will arise and you’ll think, “I’ve arrived, I’m here!” Then, the opposite will arrive, bad memories. Things you feel so remorseful and shameful of that you think you can’t go on. Or fears arise and you think I’m going to sink into emptiness and lose my mind and you’ll start to panic. You should just calmly watch the rise and fall of these conditioned phenomena and eventually, because they have no energy of their own, except for what you give it by uniting and attaching to them, they just fall away, like snow flakes hitting a fire. As you just calmly observe each rise and fall, it gets quieter and quieter. When the mind wanders, the first thing teachers tell you is to bring your attention back to here again (referencing the “square inch” located below the navel and inward) because, normally when that happens, your mind and body energy has gone up. If you bring it back in, quite naturally, the internal chatter will quiet. ​If that doesn’t work, then you use a kind of holding device, sometimes called meditation topics. A holding device is in a sense, a leash, if you want to think about it that way. Put the leash on the mind like a dog, to keep it from running away. That’s what meditation is. One holding device is to do a recitation. You can recite the Buddha’s name as a holding device for the mind. What you do is recite, “Amituofo,” four characters or “Namo Amituofo” very slowly and you lose yourself completely in that recitation. As if you were just hanging on, uniting with each sound, each syllable, and nothing else was going on almost to the point where it’s seemingly silly because all you’re doing is immersing yourself in those sounds. This focused recitation effectively, psycho-actively, serves as a leash to keep the mind from wandering off. This device is akin to using fire to fight fire or using poison to fight poison. Fire and poison are not themselves intrinsically useful but what they do is put out a bigger fire. Or, you use a poison to counteract a bigger poison. They are not the ends in themselves. Don’t think that I’ve got a special meditation technique or topic and it’s holy and sacred. No. It’s just a clever device to hold and leash the mind to keep it from running away momentarily. When the mind is not allowed to run away, it neither can grasp onto these states nor repress them. The mind is simply using the background to just watch these states come and go. Because it’s attending, these states fall away by themselves. When your mind moves out, you’ll notice that you’ve dropped this recitation. Your recitation could be Guan Yin Pusa, Namo Guan Shr Yin Pusa, Amituofo, Namo Amituofo or Om Mani Padme Hum. Take your pick. The effectiveness is not in which one. The effectiveness is in the application of your mindfulness on it. Don’t get tricked by those who will tell you that they have a special “leash” or phrase they use that’s really effective. It’s so special that’s why it’s not widely known but with a certain inducement, a certain credit card, they might tell you… No! Don’t get tricked! It doesn’t matter what it is! It’s not in the thing itself. Remember, the effectiveness is in the mind, not in the material thing that you’re using. The mind turns the Dharma Wheel. The Dharma Wheel doesn’t turn the mind. Om Mani Padme Hum, Namo Guan Shr Yin Pusa, Namo Amituofo: all three are equally effective if you use them. If you don’t use them, none of them are magical or effective. It’s that simple. A drill is only a drill if you drill with it. If it doesn’t drill, it’s useless. It’s just sitting there. Whichever one you use, bring your concentration inward. You can recite it mentally. You don’t have to mouth it. Note there are meditation retreats where they do use those names: Namo Guan Shr Yin Pusa, Namo Amituofo, and another one that is used is Earth Store Bodhisattva. People walk and recite “Namo Guan Shr Yin Pusa.” Then, they sit and recite and afterwards, they may sit in silence for a half hour or so and recite internally. Then they get up and do it again. That’s a mindfulness practice that combines sitting meditation with movement. You can see how this is done and you can do this for seven days. Gradually, through the walking, standing, and sitting recitation, this technique functions like water cutting through a groove. Gradually, it cuts a little deeper and deeper each time. Over time, the layers of your mind, your consciousness start to open up through the penetrating power of that recitation; because it’s stilling the discursive mind from running away. That’s all that’s going on. This is basically the technique. How do you use it? Use it in a very calm, even and measured way, like the breathing. What were the ways not to breath? The image you should have is a cellist or violinist, when they’re trying to hold a long note, how do they do it? For those who play horns, how do they do it? When you have to play a note that’s longer than a breath, you do staggered breathing. So if you have three horns, everybody takes a breath at a different time and you very softly come in and exit so it seems like the whole horn section is holding this note. In the strings sections, if you have to hold a note, you have a technique where you go out and back. It’s so smooth because of the movement of the bone and the wrist that you get this movement and sound where it doesn’t stop. Your breathing should be that way: even, unbroken and not forced. Keep it kind of slow. Not too fast but not so slow. There’s no merit in speed. If you say it faster you won’t awaken faster. If you go too fast, you’ll get excited, over agitated, nervous, anxious and uncomfortable sitting. On the other hand, if you go too slowly, you let everyone get enlightened before you, like a bodhisattva. You start to go into the zone; a torpor, called sleep. You think you’re in Samadhi until the proctor comes up and whacks you with a stick and says, “What are you doing? !” You’re sleeping and snoring! People in Chan halls will fall asleep and think they’re in Samadhi or in the Pure Land. Don’t go too fast or too slow. Find the Middle Way for you and then keep it regular. If you find it speeding up, your mind is starting to race. If you find it slowing down, you’ll find that you’ve actually sunk into a dull emptiness. Keep a steady, even keel. If your eyes don’t close and you do this correctly, you will have an energy that’s not too quick and not too slow. It’s really focused. Another technique you can do is to layer the sound internally over your breathing. Let’s use Om Mani Padme Hum as an example. Six sounds. Six syllables. As you’re sitting, centered, and relaxed; as you inhale, you can layer the sound of “Om” in your recitation over the breath. In a sense, you have a little wheel of sound turning repetitively and it’s corresponding, layered, over the breath. The sound is not directing the breath but gently layered on top the breath. As the breath goes in, you let it ride in with the breath. As the breath goes out, you let it ride out with the breath. At all times, you’re bringing your focus down to here (the square inch). I won’t say this method is more advanced. It’s more interval, in the sense that you will then match the breathing and the internal in a rhythm, in a kind of harmony. They’re all kinds of methods. Some people do counting the breath. Some people do different recitations. Some people will do the entire Great Compassion Mantra as their meditation-centering device. A mantra is a series of sounds that is usually memorized. “Om” is the simplest of mantras. It’s just one sound. And then you have the Da Bei Zhou (The Great Compassion Mantra), which is a series of sounds in a row and it takes about a minute and a half to recite if you’re really moving along. There’s the Shurangama Mantra, which is humongous. It’s like the LA phonebook. It’s very long and takes about 10-15 minutes to recite. Some people’s minds are so wild that they feel that they have to do a mantra of some length to hold the mind steady. They require a big powerful leash or a chain. If you’ve got a really busy active mind, then you can do them all together. Whatever it takes! There’s no more effectiveness but sometimes a simple recitation, almost like a child losing your self in it, is sufficient. It’ll work by itself. You don’t have to up it or increase it. Don’t be lured into thinking that there’s some special, powerful method that you can get from some “special” teacher like in the standard cartoon where you climb up the mountain and the teacher is sitting on top of the plateau and gives you the secret. There’s no secret! The secret is sincerity and how you recite. Answer: The eyes regard the nose. The nose regards the mouth. The mouth regards the heart, which (for meditation purposes) is located in the square inch. Don’t focus it at your biological heart. Wherever you focus your mind, you will have a corresponding physiological response. Focus all your energy to the furnace of circulation and you will naturally feel calm and your circulation will feel very at ease. Your complexion and everything will just feel nicely cultivated. It’s a very calm centered thing. Good athletes move from here. Part of training good athletes is training them in this practice. I have good friends who train Olympic athletes who increased their performance by doing contemplations through yoga and meditation, brought their attention down here. It has some benefits in a physiological sense but that’s not why we do it. Gymnasts, singers, musicians, and actors also learn to bring their energy and focus down here. So, if you bring your energy down here, things get a lot easier. It’s really interesting that this center in many ways benefits your health and wellbeing. When you’re in pain or going through a difficult surgical procedure, it will help to bring your attention and mindfulness down here with your breath. It’s quite interesting how that works. Because you’re relaxing, you’re taking the tension and the constriction in your capillaries away. Answer: This is the paradox. You want to be reciting the mantra from down here (referencing the “square inch”) where your mind is. Some people will visualize a wheel turning down here. It’s the Dharma Wheel going round and round. It’s like a little water wheel going around, “Amituofo, Amituofo, Amituofo.” It’s quite liberating to not be up here (referencing the head). You feel vulnerable but what’s there to worry about down here. In addition, your awareness is heightened and more responsive when you’re relaxed and coming from down here than when you’re trying to anticipate and coming from up here. This is one of the reasons why athletes and martial artists use this technique. When you’re sparring in martial arts, if you’re moving from up here, you’re actually slower. You’re anticipating. If you’re centered down here, you’re responding like a mirror to the movement so when your opponent moves, there’s no mediated thought. You’re immediately responding from that relaxed, open space. This is why Chan or Zen is sometimes associated with martial arts. I want to say a bit more about this because I don’t want to give the impression that this is an ultimate practice. There are lots of different practices. There’s reciting the Buddha’s name, bowing, memorization, recitation and so forth. Meditation is only one. They’re all equal in the end. They’re just expedients. ​When I say bring your attention down here, do not think that this is the mind. This is not the locus of the mind. I’m bringing my attention to my mind. It’s not called the mind. This area is just a focal point that happens to be a pretty good observation point or centering point from which to observe the workings of the mind but it’s not the mind itself. Don’t think that this is the mind or the locus of the mind because the mind has no location. What I’m teaching you and what was taught to me is that this mental cultivation is only provisional cultivation. It’s not the direct, real cultivation. It’s just provisional. It’s a training device like the training wheels on a bicycle. Just because you can ride on a bicycle with the training wheels doesn’t mean you’ve mastered the bicycle. You’re just using this to get your muscles in gear to get the feel of the rhythm of it. Eventually, you raise the training wheels up a little bit so that if you tip it will still catch but the goal is to ride without the training wheels. Calming the mind, Dhyana, or stilling the thoughts: this goal is just a technique to open the mind to its full uses. You’re calming the mind and stilling the mind only because you want your mind to stop running all over the place and in its calmness, begin to return to its full working capacity that it has. So, don’t get attached to the sitting meditation. It’s merely a kind of expedient practice to correct an overexertion of the mind running out. Once the mind is stilled and you start to get a flavor of its uses or its function, then the training wheels can start to come off and you can start to really move. The calming, stilling, settling: these are all words to be used for this. The one that I like is equanimity and so the mind is in balance. It’s responding appropriately to things as they are. It’s not getting overly excited; it’s not running away and so on and so forth. All of this comes down to a sequence where you have Sila, Samadhi, and Prajna. These are called the Three Non Outflow Studies. The Sila is the purifying or purity. The Samadhi is the stilling of the mind. The Prajna is the insight or the “seeing.” It occurs naturally when these other two are working correctly. The heart of the meditation school is bringing these three into function. When the Sila and the equanimity are working, then the mind naturally begins to see things as they really are and it expands. Question: What do you mean by purity? Answer: Purity in one sense means what you do with your body, mouth, and mind. It’s not harming others. It’s not harming your self. It’s not deceptive. It’s not malicious. It’s not unhealthy. It’s “ahimsa,” meaning non-harming. Purity also means that you’re not running out. You’re not admixing or not mixing your energy with things that are forming attachments and moving away from being your real center. When you’re grasping and attaching; when your thoughts are disturbed, you start to think you’re lacking and that you don’t have it and you seek outside. That’s admixing. You can’t connect with any of those things since “All things are like dreams, illusions, bubbles and shadows.” So, ultimately where are you going to set up and say this is me and mine because you can’t say I got this, because it slips through your fingers. Purity means finding a deep contentment in your own being that knows I’m ok. It’s enough. I’m sufficient. I don’t have to seek outside wildly. I’m ok just as I am. The impurity is not some moral, judgmental thing as much as it is getting confused and running around; getting off your center and then getting mixed up, confused and what not. To find it again you have to un-mix and disentangle. That’s what purity is about. This is presented as a sequence: first you have the purity, the Sila. 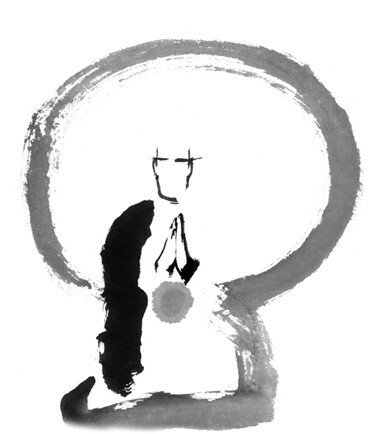 This leads to the concentration or the equanimity of mind and then comes the insight. In fact, they are non-dual. They happen simultaneously. However much you don’t move from that center, immediately you have focus and awareness. Your mind is not scattered and immediately your perception is more clear and insightful. So it’s simultaneous and not necessarily a sequence. One meaning of “wu ar “ is non-dual. You’ve all heard this expression? The Buddha in the Sixth Patriarch’s Platform Sutra says, “The Buddha Dharma is a non-dual dharma.” The Dharma of the Buddha is a non-dual dharma. So, concentration, meditation, and insight are one single fabric, one single thing. The mind is not some entity or organ where people can ask, where is the mind? You can’t say the mind is here. It’s not that. It’s actually a dynamic interaction. The term that might work here from a neuroscience magazine is “distributed property“ or “distributed phenomena.” It means that memory or language functioning is not a localized brain activity. You can’t say, here it occurs in the brain. It’s right in this quadrant; right here and when you talk, that quadrant lights up. They say it’s actually a distributed property because all sorts of things are happening throughout the brain, the system, including other organs. So when you have fear, it’s a distributed property. It’s not just “here” but it’s throughout. Memory, learning, and cognition, are distributed properties. The brain functions are highly complicated and when you look at these MRI’s, you’re not just seeing one area light up, you’re seeing something like Christmas tree lights where different lights twinkle off and on in various places. That’s how the brain works. It’s distributed. Consciousness is a distributed property. It’s not just in one location. If you think about it this way, when you’re cultivating the mind, you’re cultivating the consciousness as it’s distributed over all kinds of wherever you distributed it: sights, sounds, smells, and tastes. It’s distributed into memories, dreams, and reflections. It’s intertwined with the ten thousand things. That’s where it is. It’s just out there mixing all the time. Even when you turn off your devices, your mind is still plugged in. Even when you go to sleep, your mind is still plugged in and mixing with the ten thousand things. Mind cultivation or meditation just isn’t this (referencing the brain or head). That’s only giving you a platform to be able to observe this consciousness as it’s going out all over the place. What you’re doing is disentangling your consciousness from this matrix that you’ve sent it out to. You’re disentangling it and letting it come back from its confusion and delusion. The Chinese metaphor that I like is that you bring it back from the dust. Imagine that your consciousness is in a dust storm, just mixing into everything that comes along in a cloud of dust and you bring it back. You turn your back on the dust and reunite with the clear, calm, purity of the mind that’s centered again. The fragmented awareness that’s happened to our consciousness is like a light that just scatters in all directions. The laser like function of bringing the light back then allows you to really penetrate which is one of the things that meditation is doing. If you follow the logic of this, you’re moving through stages where your purity, although it’s essential for stillness, it’s the same as stillness. People say they’re cultivating purity because they took the precepts. Do you know what it means to take the precepts? It happens usually when people take the refuge ceremony with the Buddha, the Dharma and the Sangha and then they take the precepts. Taking the precepts is just the most initial step to committing your mind to returning to something. Once you take the precepts you must become the precepts. In other words, you take them as a kind of device you’re using but after a while they become so internalized that you get the rewards from holding them and you actually transform. You become them and you don’t have to think about holding them anymore because your natural tendency is to stay pure. They’re guides to get you back to that original, natural feeling. Once you’re there and you taste that, it’s like, “Wow! I don’t want to leave this!” You don’t have to hold the precepts anymore because even the feeling of moving out of that space of centered clarity is so non-attractive, you don’t have to think about it. You don’t have to worry about, “Oh, I really have to not kill here,“ because your conscience is so rarified, even the thought that leads to killing, the anger, the hatred, is already too much for you, much less the act of following through. This is “becoming the precepts.” By becoming the precepts you’re not taking on an altered identity. You’re actually truing yourself to your natural identity, your natural state. That’s why the Sixth Patriarch says, “When your mind is regulated and subdued and returned in this way, you don’t have to think about holding the precepts.” This is true precepting. In the 1960s, a person at a hippie gathering in Vermont asked Robert Frost, “Hey, Frost, so what’s freedom?” Without even thinking, he said, “To me, riding easy in light harness.” Now of course, you know he’s coming from an agricultural background. The meaning is when you have a horse that has a relationship with you and has been trained and subdued, you can put on the harness very lightly and you’re just riding easy; and all you have to do is just lean your hand slightly and the horse naturally goes that way. You don’t have to have a tight harness. The image I have is when I was in Burma. I was sitting in a stupa. The sun was coming down and I could hear this sound. I looked down and the farmers were coming from the fields and they have this little wooden cart with these big wooden wheels pulled by an ox. There are little grooves in the road where these wheels set in and the farmer is just sitting there. He’s got the harness in his hand and its attached to the ox but he’s just sitting there, nodding off and the ox is just going home. Riding easy in light harness. To me, when you are tamed and subdued, you can move through life like that. You don’t have to have this whip and tight harness and go here and go there. You’re repressive and uptight in your energy. Once you’ve figured out the road and you’ve tasted that freedom, you relax. When the precepts can hold themselves in this way, that’s the beginning of becoming the precepts. When you’re doing this meditation practice, which is just the beginning of the big return, of bringing your consciousness back to its root. It’s called going back to the root, returning to the source, finding your original mind. One metaphor from the Chan School is that you’re going back to the wind and light of your original ground, your homeland. I like that image. You know when you grow up someplace, there’s a wind and a light. There’s a feeling and sometimes a fragrance. When I’m back on my farm in Wisconsin, I associate the light of the morning and afternoon and I know the wind just before it rains, and the lightening and thunder you get. There’s a smell that comes off the earth that’s unlike anyplace else. When I’m there, I can sit with my eyes closed and I know exactly where I am. It’s the smell of the earth that’s unique to an area and when the rain actually comes, the smell just bursts forward. That smell just before the rain comes; that’s a metaphor for the original ground. When you’re really cultivating you start to feel like you’re in that space all the time. You’re in your homeland. This is called the return or the going home of the meditation practice. Because we’ve been going out so much, scattered, linking in, that’s what feels natural to us. In other words, the unnatural feels natural to us because we’ve habituated. When we reverse and go back, it doesn’t feel natural. There’s a kind of discomfort, unsettledness, or murkiness. How long we’ve been away determines how unnatural and murky we feel. The way of going out is one we know. The problem with going out, is the further you go out, the further away from that, you move. The return is elongated. It’s made longer by the wilder you’ve let your consciousness roam just like you’ve let the field overgrown. With one season, you can do something. Three seasons you can’t even find the field anymore where I come from. The point of the weeds is much more difficult. If you let it go too long, the rocks start to come up again and you have to get the rocks out before you can get the weeds out. If you cultivate it seasonally, you don’t have this problem. The longer you let it go to seed, the harder it is. When the mind goes out in this way thinking that it needs something, it gets a bit of a fix with one of the things it’s after. There’s a kind of momentary high of, “I got something!” But then, what quickly happens is that because you can’t hold it no matter what it is…it could be a thing, a feeling, an experience, or relationship. Whatever it is that you grab, quickly plateaus and then it’s over and then there’s a slight let down. Then what happens is the mind goes out a little further and raises the ante a little. This is called “hedonic adaptation.” It’s a psychological term but a useful one. The hedon, the enjoy, pleasure part neutralizes after indulgence. The indulgence has to be increased because you adapt. In other words, you reach a copasetic neutral zone because experience relies on contrast. Once you’ve had your first bite of food, the second and third isn’t as big a rush anymore. By the time you’re on your eighth or ninth bite, you could be eating cardboard and you wouldn’t know it because the initial burst is over. So if the next meal has that same spice and flavor, you’ll need to add a little more to get the same rush or feeling. This is what happens in drug addiction and how it pyramids up. All sensory experience follows the hedonic adaptation model. We plateau and adapt. A female psychologist made this observation in her children. A week after getting their toys, the toys are just sitting there, unattended. They were bored and needed to have new toys. She would say to them you’ll adapt and they wouldn’t know what she was talking about. They would get the new toys, and they’d be excited and within 4-5 days, those toys would be passed on. Her husband would come and say we have that 32-inch screen, I want the 52-inch and she says you’ll adapt. Once he gets the 52-inch, within an “x” amount of time, it won’t be big enough. It’s never going to be enough because hedonic adaptation requires more and more. There’s a saying in Buddhism that the mind of greed, of wanting is like a bottomless pit, the more you put in it, you can never fill it because it just sinks into this dark hole. Answer: I’m describing the over excited, over-stimulated, franticness that’s driven. This doesn’t mean that you don’t have sensory. This doesn’t mean that you’re numb and deny the senses as this would be going to the other extreme, which, interestingly, only increases the longing for them. People who say that they are going to end this desire and repress it actually just end up inflaming it. It’s very tricky how you work with this. Seeing through it and getting it balanced. This is called the Middle Way. What we may call sustainability: not too much, not too little, what’s appropriate. Once you get there, the senses are still working very actively but they’re not being flooded or repressed. Moreover, there is a contentment of knowing when to stop and knowing when is enough that then leads to a feeling of real joy and liberation as opposed to a nervous longing and wanting more. One of the markers that you’re in that state is knowing when you have enough. Your senses are totally appropriate, totally balanced and you know when to stop. What’s known is that hedonic expectation is even greater than hedonic enjoyment. Hedonic expectation is the anticipation of getting the thing. Often times when you’re sitting in meditation, there’s hedonic expectation. When we’re done tonight, we’re going to go out for one of those pizzas… You’re thinking about it and your mouth is watering and that pizza is starting to become out of this world! The longer you sit, the more that pizza becomes an incredible object of desire. You’d rather have that pizza more than anything else. Hedonic expectation is the feeling you get anticipating the reward that’s coming. It becomes a greater lure than actually getting it. This is where advertisement is effective. It creates and stimulates hedonic expectation. This rush is what the Buddha said is the fuel of desire that keeps us so off center. It’s either hedonic expectation or we go into hedonic indulgence and then into hedonic adaptation and it keeps going. That’s what He described as dukha, as dissatisfaction. When you try to stop the hedonic pattern, the first feelings you have are not joy and contentment enlightenment but a kind of discomfort because you’re reversing that pattern. The psychological emotional state that occurs in the early stage of cultivation seems unnatural at the beginning but overtime turns into a great sense of liberation and joy, of riding easy in light harness. Once we get the theory down, we should expect that when we do the sitting, when we do the return, all these circuits that have been going out, continue to want to go out. When you sit in meditation, in a sense, you’re putting a little harness around them and they’re going to want to push really hard and the pizza will want to come up with even more fervor than if you’re just sitting around on the sofa, etc. When you’re sitting and trying to watch your mind and say, “Is it need or is it greed?” Just recognizing what’s happening gives you a kind of strength. It’s when you don’t know why this is happening and you think, “Oh, my meditation is not working!” Actually, it’s very effective because the outflow has been brought back a little and now there’ s a kind of pressure building. As you bring that light back, it grows. Now to you it seems like it’s explosively growing but that’s because we’ve let it be scattered so long that our natural fullness feels strange to us. If you just bring it back and you’re patient; you don’t try to repress the pizza; you don’t try to imagine it further. If you don’t repress and you don’t enjoy but just watch it and harness it back, all of a sudden, it just fades. It requires you to attach by either repressing or inflaming but if you don’t do either, on its own, it’ll just subside. You will find that, “Wow, that’s interesting. If I just stay in this place and come back to the center, this thing rises and falls and comes back again. Once you have that initial insight; that it relies on you to attach or repress it, otherwise it’s not there, it’s empty. Bit by bit, you’ll get this and that light that comes back is so powerfully enjoyable, so liberating, that it’s actually better than the pizza! This is a psychological process the Buddha has mapped out very clearly and I don’t think it’s ancient. It’s extremely present in our day-to-day existence.